Once a year the population of my hometown swells to ten times its normal size and more. St. Jacques is one of six communities which comprise the town of St. Jacques-Coomb’s Cove whose total population in the 2006 census was 669 people. St. Jacques itself has approximately 100 year-round residents. During the second week of August the place is buzzing with visitors as final preparations get underway for the annual South Coast Arts Festival. You can feel the excitement, the anticipation. There are elements of celebration and rejoicing as former residents return and are welcomed by those awaiting their arrival. They bring with them family members and friends, first-time visitors and seasoned festival goers. Traffic along the main street through the community increases as each day passes. There are many more people walking through town, stopping in at the local stores, visiting cemeteries, hiking the hillsides and shoreline. There are even lineups at the corner gas pump. These things aren’t limited to St. Jacques. You can feel and see them in English Harbour West, Mose Ambrose, Boxey, Coomb’s Cove and Wreck Cove. It’s there in Belleoram and Pool’s Cove, and to some extent in Harbour Breton, Hermitage and Baie D’Espoir. In fact the entire Connaigre Peninsula feels it. Plans are made in all of these communities to be in St. Jacques for the Festival weekend. B & B’s have been booked since last year. Motor homes and travel trailers begin arriving around mid-week. The Festival site goes through its final round of readiness followed by a flurry of activity as final measures are carried out. 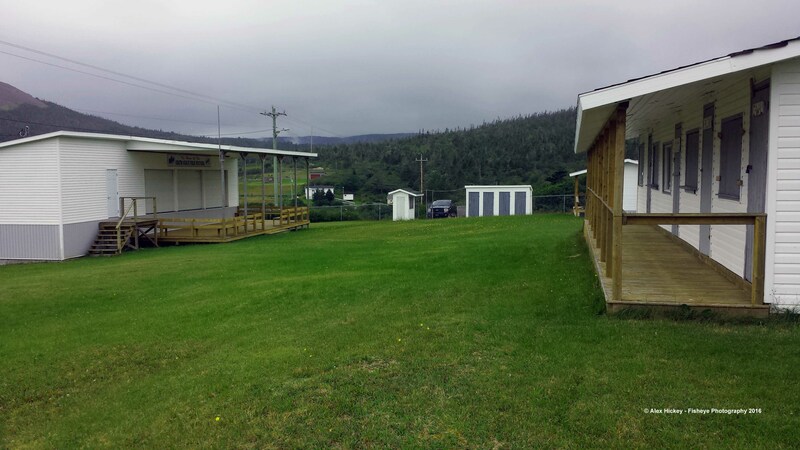 The grass is cut and trimmed, minor repairs carried out on the stage, washrooms, fences, buildings, water supply and parking lots. Flags are raised, pennants strung, paint touched up, washroom facilities cleaned meticulously and all tested to be flushing as they should. Food concession groups gather to check out the facilities they’ll be using throughout the weekend and get their stores in order. The sound crew arrives in a massive transport truck and like a well-oiled machine hundreds of components are assembled, checked and re-checked until the sound man feels all is ready for someone to walk on stage and strike the first chord. Facebook and other social media have been sharing up to date information several times daily prompting followers to post comments, stories, photographs and videos of previous festivals. Behind the scenes planning has been underway for months. Organizers have been going over details, making adjustments, reviewing the previous festival for lessons learned and assigning responsibilities for 2016. Performers have to be contacted to confirm participation then contacted again as the dates approach. Performance schedules have to be developed in consultation with performers in order to accommodate personal commitments throughout the weekend. It’s a process of consultation and give and take. Plaques for any deceased performers have to be designed and ordered, tributes written, publicity planned, bar services organized with bar tenders hired and scheduled along with all supplies ordered. The entrance gate workers are scheduled, security arranged and scheduled, programs copied and distributed, perimeter lighting checked and repaired if necessary, consumable supplies ordered and inventoried, along with a hundred other details. Then, on Friday evening at 8:00 when the first performer steps up to the microphone the party begins on the Festival Field! This year over a thousand people came through our gates, filled our seats, crowded together in pockets on the field and in the beer garden to make this year’s Festival one of the best ever! Behind that success is a group of dedicated volunteers who give freely of their time and talent to bring the event to the field each year. These volunteers are on our stage tirelessly performing from Friday evening to Sunday night. They are providing security, monitoring the crowds, greeting visitors, managing the stage, overseeing hired staff who are serving the bar, cleaning the washrooms and selling refreshment tickets. You will see them at the partnership events as well. On the night before the music weekend gets underway the Nickel Independent Film Festival Roadshow takes place in the St. Jacques Community Centre. On the second day of the Festival a 5K and 10K walk/run is hosted with the St. Jacques-Coomb’s Cove Recreation Committee – all run by volunteers. These statistics are true for those who make the South Coast Arts Festival a success. I have been volunteering at this event for its entire life as have some others. It is sometimes risky to identify a few names when so many contribute; however, there was a core group this year who deserve particular attention. These are Conrad Williams, Cyril Brown, Mark Courtney, and Dwight Williams. Their contributions were critical. They were there every day for every session. Leadership at its best is transparent and we see superb leadership in the quiet and unassuming ways these gentlemen deployed their skills and capacities throughout the entire weekend. Hats off to all of the volunteers! If you haven’t been a volunteer at the event or would like to re-engage with it, this is your year to do so. As the Festival enters its 32nd year perhaps it’s time to put your name forward to become a part of this rewarding event. Beautiful words ….Volunteers make our world a better place . I have put this yearly event on my bucket list ….I sure hope next year I can make it happen ! !